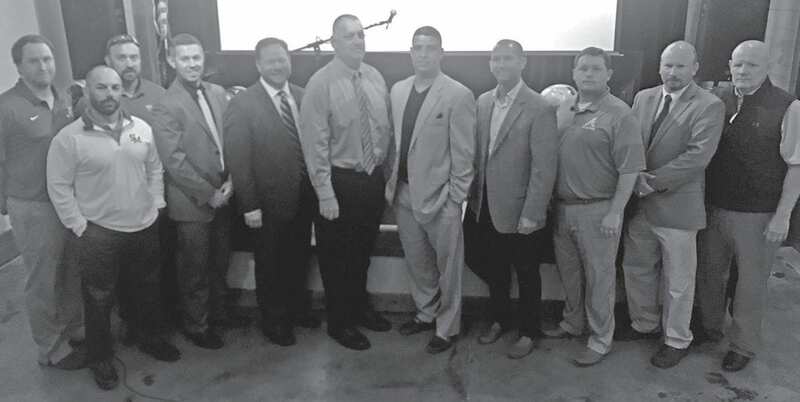 High school coaches attending Media Day 2018 at SwampTails are: (from left) Robert Beard, Heath Lauderdale, Kyle Davis, Zach Jones, Todd Cassity, Keith Register, Chris Musso, Drew Gilmer, Barry Simmons, Kevin Bird, and Phil Phillips. Blount County made a strong showing at the North Central Alabama High School Football Media Day held at Swamp Tails in Oneonta last week. All Blount County football programs were in attendance and had much to talk about. Rob Beard is entering his first season as head coach at Appalachian. During his time at the podium, he introduced his representatives and oldest linemen Chase Roberts and Jacob Pelham. They both will be four-year starters this season. Look for the Eagles’ strengths to be their high energy and eagerness to win. Obstacles will be depth issues and the number of players on the roster. Appalachian’s first game is against Southeastern on Aug. 23. Cleveland’s new assistant coach and defensive coordinator Zach Jones represented the Panthers. Returning starters with Jones were quarterback Andrew Green and offensive lineman Issac Kelly. The Panthers have many returning starters and diverse players who are ready to play multiple positions. During the off-season, Cleveland has been working on building depth. Their schedule will begin with one of their biggest games of the season at Locust Fork. Coach Keith Register began with Hayden’s motto for the season “God, family, Hayden.” In attendance with Register were running back Jay Burrows and corner Garrett Trimble. Register praised their diverse abilities and the Wildcats’ efforts to get the best players on the field on offense and defense. They plan to make the playoffs for the fourth year in a row. After going from 27 seniors last season to this year’s 11, with only four that have played, it is going to be a tough schedule in a difficult region. The Wildcats will face Springville for their first game at home. The Locust Fork Hornets will have a young team this season. However, there will be seven starters returning on defense and five on offense. Coach Chris Musso brought four-year starters Brody McCay (running back) and Hunter Neely (linebacker). The Hornets new stadium is bringing a new excitement this season. Locust Fork will debut their new stadium against Cleveland on Aug. 31. First-year Oneonta head coach Phil Phillips attended with returning starters Jaden Kent, senior wide receiver, and Ethan Faust, senior offensive lineman. Oneonta is returning multiple contributors on both the offensive and defensive lines. There are some non-region changes to the Redskin’s schedule, adding Ashville and Hokes Bluff. With a new coach who says this is a “lifelong dream” to coach at Oneonta, look for a new enthusiasm from the players and coaches this season. The Redskins open at Priceville on Aug. 24. Coach Todd Cassity expects this year to be a special season. This year’s senior class has been with Cassity since they were freshmen. They have 15 seniors, three of whom are coaches’ kids. In attendance with Cassity were linebacker Jaxon Bullard, quarterback Noah Allison, and wide receiver Cole Littleton. Three offensive linemen return this season and their linebackers look to be the Tigers’ strength. Their secondary is young and the team lost four of five starters. The Tigers are hoping to have enough depth so that no players are forced to play two ways. Last season the Tigers made it to the second round of the playoffs and they are on the road to build and work to make the playoffs again this season. Cassity and the Tigers open with Jacksonville. Among the three new Blount County coaches, Kevin Bird will see his first season as head coach at Southeastern. Tailback/corner Jordan Graham and offense/defensive lineman Christian Borella were in attendance with Bird and look to be standouts this season. One strength for the Mustangs is that they will be two to three deep at the skill positions. However, the line has only one returning starter. Bird mentioned their biggest desire is “to win a region game.” Southeastern will play Appalachian for their first game on Aug. 23. After Coach Heath Lauderdale was hired five weeks before last season, this year will be different for the Bulldogs. With a new attitude and commitment, Lauderdale reports that roster numbers are up, with 49 players this season. Among those were media day representatives Andrew McEvoy and Drew Williams, who will both be players to watch this fall. Susan Moore has a tough schedule with no easy weeks and big rivalries with Oneonta and Cleveland. Susan Moore will play West End for their first game on Aug. 23.